Frozen ice painting is super-fun on its own. 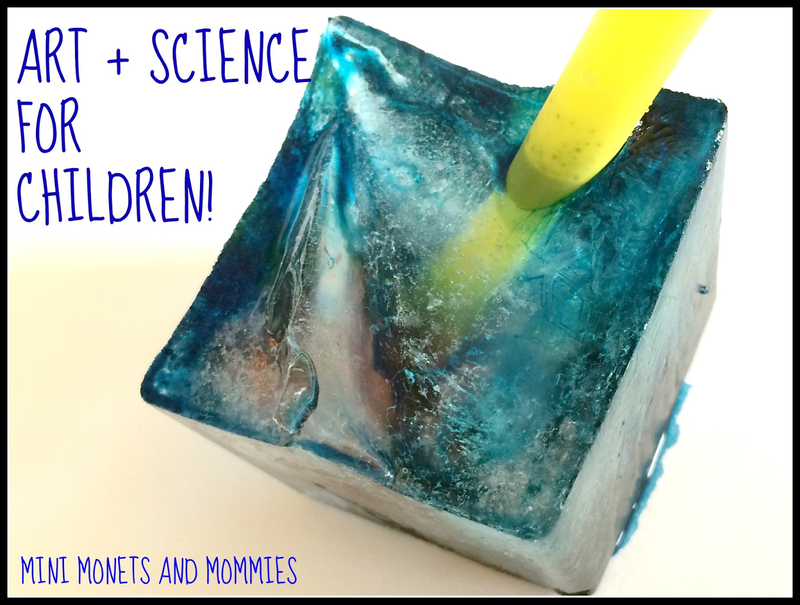 Add in a science-y layer and your kids can spend a hot summer day getting artsy while making their own discoveries. I’ve done chalk ice, glitter ice and plain old colorful ice paintings before. This time I wanted to try something a little bit different. Instead of just freezing colorful water, I started with plain old ice. As the water froze, we checked in on the cubes and began breaking them up to form layers of ice within ice. Before you begin the painting part of this activity, prep your work area for the mess. Food coloring stains easily. Protect your kitchen table, floor or wherever else your child is working by layering a garbage bag over a piece of cardboard. Or, go outside and work in the grass. 1. Fill the ice cube tray almost all of the way up with water. Ask your child what she thinks will happen before you pop it into the freezer. Use some science vocab and tell her that she is making a prediction or hypothesis. 2. Check in on the ice. Let your child poke it to see if it’s changed from a liquid to a solid. As it begins to harden let some of it melt or have your child poke it hard enough to break the surface ice. Put the ice back into the freezer. 3. Take the tray out again. Have your child poke straws through the top of each cube (one straw per ice compartment). If it won’t go through, ask her what she can do to make the straw move into the ice. Hint: It needs to sit out and melt a little. Talk about what’s changing in the cubes that allows the straw to go through the ice. Place the cubes back into the freezer again. 4. Bring out your ice, again. Drop a few drips of food coloring or juice into each straw top. If some of the water has gone up the straw and frozen, let the tray sit out until the ice melts enough to let the coloring in. How will your child know that it’s melting? 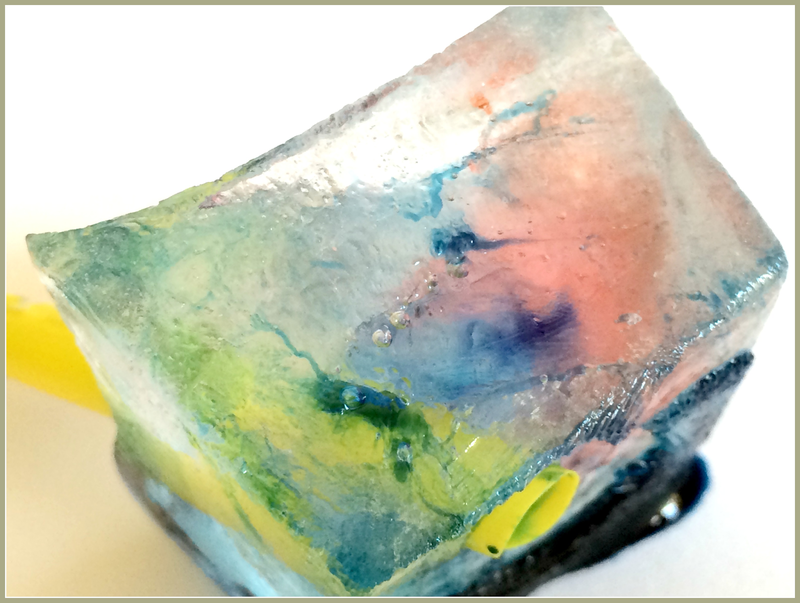 She’ll see the color slowly move into the bottom of the clear cube. As it moves through, she’ll see streaks and veins of color in the layers of ice. She can add more than one color per cube to see what happens. Put the ice back in the freezer. 5. Wait a half hour or so and bring out the ice. Pop the cubes out, keeping the straws in them to use as handles. 6. Put the colorful cubes on plain white paper. Your child can use the straw handles to paint with. 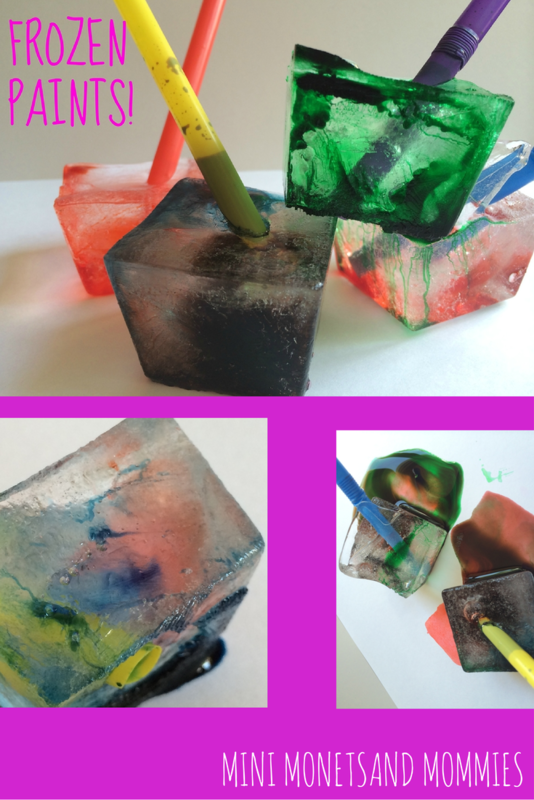 If no color is coming off of the ice right away, ask your child why (the streaks of color may not start until the second or middle layer of ice- meaning that your child needs to let the cube melt before she can paint). 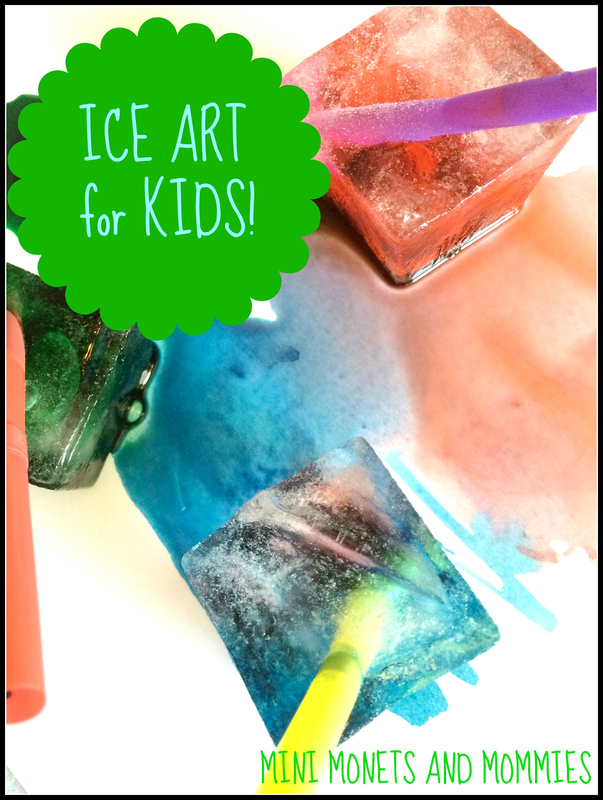 Your child can also explore the colored ice in other ways. Fill two clear cups with water – one warm (from the tap, not boiling) and one cold. Ask her to predict which cup will help the ice melt faster. Place a colorful cube in each cub and watch what happens. Your child can play the role of a scientist, figuring out why one cub melted faster than the other. If you’re using an edible juice version, your child can drink the colorful water from the cool cup! Are you looking for more art and science activities? Join my e-mail list for activities in your inbox and follow my Pinterest board for ideas! What a fun learning activity! Featuring on Family Fun Friday this week - thanks for linking up! Thanks! I love to share! Oh, how neat! I love the layers. Thanks for sharing at Sharing Saturday! This looks like loads of fun! Thanks for linking up with The Thoughtful Spot! Looks like such fun! Thanks for sharing at the NEW #PinFest!